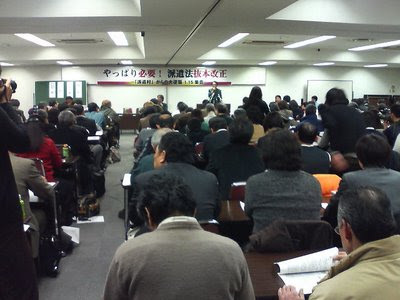 On January 15, 2009, a “Fundamentally Revise the Worker Dispatch Law Now!” meeting was held at the Japan Education Center in central Tokyo and the venue was packed with 400 participants. The place was filled with excitement, following the success of the “Haken (dispatched workers) Village”. Many participants were moved by a story of a “villager”, who said, “I was saved by the Haken Village as I knew it on the day when I was prepared for suicide”. 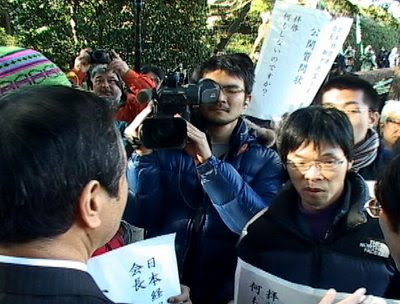 Yuasa Makoto, leader of the village, made the following proposal in the symposium, “The situation will be even worse. What we need to do is to pressure local governments nationwide into building shelters and opening consultation services. Koyano Takeshi, Takeshi Koyano, secretary general of Japan Construction and Trasport Industry Workers Solidarity Union, appealed, “Firing temporary workers before the termination of their contracts is the most serious crime committed by companies in postwar Japan. We, as a trade union, pursue the responsibility of big businesses as our role”. 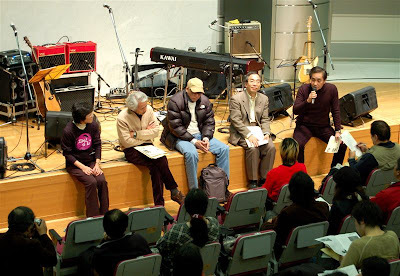 The epoch-making meeting was gathered by Rengo (Japanese Trade Union Confederation), Zenroren (National Confederation of Trade Unions) and Zenrokyo trade union confederation across their policy boundaries. About 1,500 people gathered at a rally held by the “Light to Gaza! Jan 10 Peace Rally Executive Committee” (hosted by 12 groups, such as the Japan International Volunteer Center, or JVC, and Peace Boat) at Shiba Park in central Tokyo. 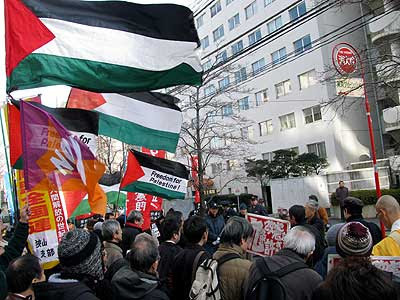 The demonstrators, including many Palestinians and people from outside Japan, marched to the Roppongi district, calling for an immediate ceasefire in Gaza in the winter cold. 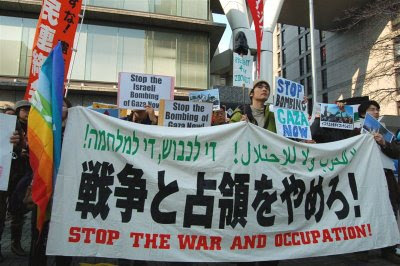 On January 11, a “Speak-out and Demonstration: Israel, Stop Occupation and Invasion to Gaza!” meeting was held in Yotsuya, Tokyo. About 250 people joined the event. 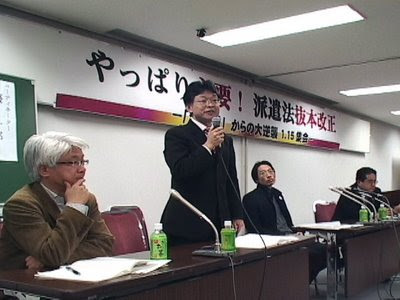 Abe Hiromi, expert on international human rights law; Ukai Satoshi, member of Teach-in Okinawa and professor of Hitotsubashi University; and Ogura Toshimaru, member of the People’s Plan Study Group delivered speeches there. Then, the participants walked in the Shinjuku district in the evening, chanting, “Free! Free! Palestine”, “No More Genocide”and“No More Occupation”. 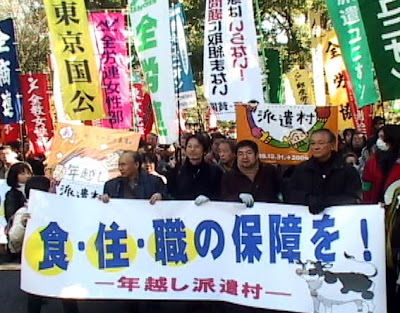 On January 5, 2009, the “Year-Crossing Haken (dispatched workers) Village” set in Hibiya Park, central Tokyo, totally withdrew and more than 340 “villagers” moved to new facilities. The total number of “villagers” was about 500, and they were supported by about 1,700 volunteers. Donations sent to the village amounted to 23,150,000 yen. At a meeting before marching to the Parliament, Abe Makoto, Secretary General of Japan Community Union Federation, passionately said, “The Haken Village started small but achieved big. We acted together and reached hope for changing society. Let’s continue our action and struggle for achieving work without fear”. A long line of demonstrators to the Parliament was exactly a “march of the poor in anger”. Eventually, a meeting was held in the Diet building about the issue and many lawmakers joined it. “Villagers” of the “Haken (dispatched workers) Village” exceeded 300 as the new year came, well beyond its capacity. Therefore, the village strongly requested the Ministry of Health, Labor and Welfare to support the “villagers”. 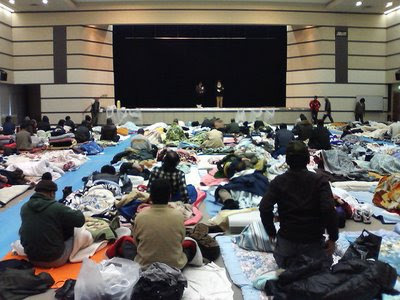 As a result, the ministry was obliged to open its hall for overnight stay from January 2 (photo). This was epoch-making. A 53-year old man said in a joint interview in front of the hall, “I lost my job at a construction site on December 6 and had to sleep in a washroom of a park for three weeks. 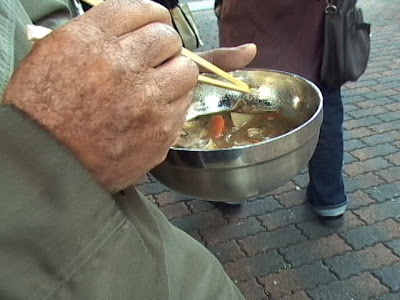 I managed to survive only with a piece of bread of 98 yen per day, but all of my money was only 3 yen when I arrived at the village. I really feel relieved here. I will apply for welfare benefits together with the fellow villagers next week”. All who came to the Haken Village were in dire straits. 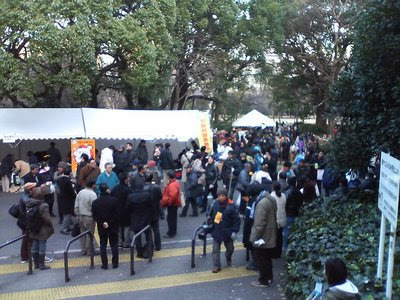 Hibiya Park Tent City Swells to 250 people. Organizations from Across the Board Volunteer to Help. Some 130 jobless people, recently laid-off temp workers from Sharp Corporation and Yamaha, gathered to spend the New Year encamped at Hibiya Park “tent city” from December 31. There were some who literally did not have a cent to their name. After hearing about the tent city through the media, approximately 360 volunteers came to help and donated a mountain of goods. The traditional New Year’s dish of soba noodles with rice cake was given out for the evening meal (see photo). Many trade unions also turned out to volunteer their help. One trade unionist said: “Rengo, Zenroren and Zenrokyo have all turned out. We’ve all come together with one intention and that is that we have to do something. I hope this will be the beginning of a new movement.” On the nights of January 3rd and 4th, the videos “I want a normal job” and a three-minute recording from the Labor Fiesta respectively were shown in the Dialogue Tent. The number of campers continued to increase and at the time of writing this report (January 1st), had already swelled to over 250 people. NB: The Tent City eventually grew to more than 500 participants over the next few days. Click link to see video of the opening of the camp. Volunteers’ opinions available on UnionTube. Several Hundred Protesters Gather In Front Of Embassy To Denounce Israeli Air Strikes. 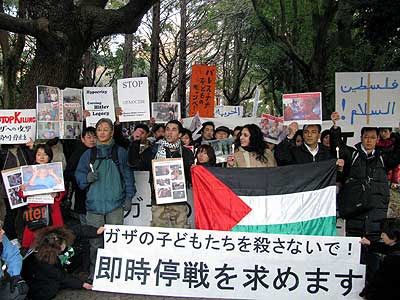 On the afternoon of December 30, there was an emergency protest against the inhumane Israeli bombing of Gaza in Palestine. 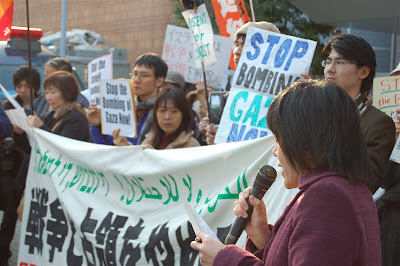 Some 100 people responded to the online call out and gathered outside the Israeli Embassy in Koujimachi, Tokyo, expressing their anger against the bombing. Despite police intimidation, protesters continued to gather in their numbers throughout the day. Placard-carrying protesters chanted: “Stop Israel’s bombings, Now!”, “Open dialogue with Hamas, No to Occupation!”, “Japanese Government should stop giving aid to the occupation!” A further 300 people gathered for the evening candlelight vigil called by Amnesty International. Reported by Y. Click here to see the demonstration on YouTube. Unions gathered to issue their joint appeal to fight layoffs and contract terminations at 4pm on the 24th of December at the Ministry of Health, Labour and Welfare’s press club. 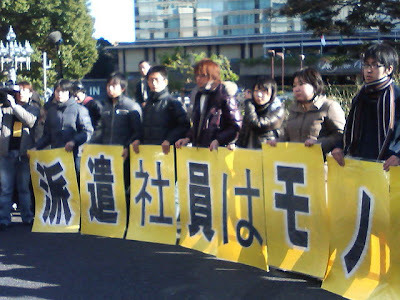 The participants, who are facing redundancies and layoffs (see photo), included workers from Isuzu, Hino Motors, Nissan Diesel Motor, Mitsubishi Fuso, Toyota, and Oita Canon. Through collective bargaining, some unions have managed to reverse dismissals and have secured ongoing accommodation in the company dormitories. Despite these gains, however, there is no overall change to their dire situation. The unions jointly demanded that they want an immediate end to the mass sackings, employment and accommodation insurance, and stressed the companies’ social responsibilities. Joint action is also being planned in order to achieve these demands. 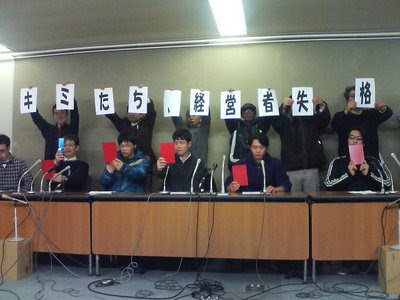 One of the participants expressed frustration at what he saw as the indifference of regular employees towards casual workers being laid off (Photo of unionists issuing dismissal “red cards” to management). DVD of “Winter Soldier: Testimonies on Iraq” completed.Testimonials of returning soldiers from Iraq. 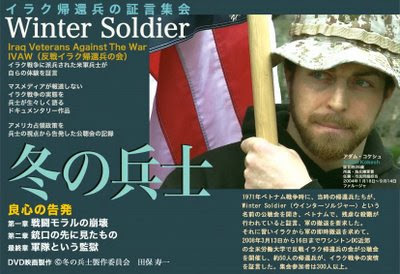 “Winter Soldier: Testimonies on Iraq”, a DVD recording of the testimonials of returning soldiers from Iraq has been completed. In March last year, “Winter Soldier”, a historically significant public hearing was held in a suburb of Washington. Some 50 returning soldiers from Iraq gave their testimonies on what they had been doing in Iraq. Their accounts told of actions in Iraq that can only be described as crimes. Speaker after speaker spoke of the systematic murder, violence, and about the most unspeakable, horrendous acts that they were forced to commit. I was moved by these returning soldiers’ courage and wanted to communicate this in the DVD. I urge people to see this DVD and to understand the war crime that is the Iraq War, but to also see the courageous stance being taken by these young US returning soldiers in opposition to the war. (Written by Jyuichi Tabo). Click here for the “Winter Soldiers” homepage. In the discussion of “The Power of Culture”, Akira Matsubara(Labornet Japan) commented that: “I consider the power of culture to be in satire, humor and rage. All of the works reflect the times, and I can deeply sympathize with them all. I think that solidarity will emerge once we realize that other’s problems are our own too”. 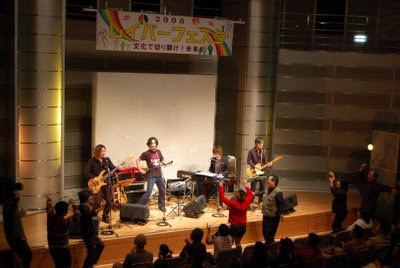 The evening entertainment climaxed with the live performance by Soul Flower, and participants started dancing along to the Internationale (see photo). Video available on UnionTube.